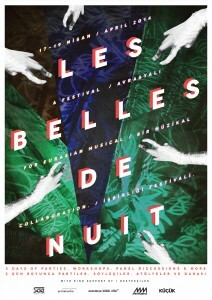 Les Belles de Nuit (LBdN) is back in-town from 16th to 19th April 2014 and ready to hit with triple-F(full-force-female)-power Istanbul’s dance floors and offering exciting day-time program as a panel discussion about the “the position and influence of female artist in electronic music”, workshops about DJing with different technologies, how to be a healthier clubber or an insight into the world of cross-dressing. In its second edition, the genuine grassroot festival takes place at its place of birth MiniMüzikhol and at Kücük. Female artist such as Viennese DJane, Producer, founder of female:pressure, Susanne Kirchmayr a.k.a. Electric Indigo, one of half of the successful group DearHead and club runner of Wake Up Call, Evrim Tufekcioglu, feminist activist, dancer and choreographer Candas Bas, Swiss festival organizer and DJ Nathalie Brunner (Playlove) and many more female DJs and producers from Switzerland, Germany, Austria and Turkey will provide an insight into their work and offering an excellent platform to exchange know-how and experiences within and between their respective local networks. At this occasion, MiniMüzikhol will be transformed into a space ship inviting you to embark on a three night vovage with different styles, sounds and dresscodes. The journey starts with “Spaced Out” on Thursday, 17 April 2014, continuing with “Nuit Rouge” on Friday, 18 April 2014, with the final club night “Crossdress” on Saturday, 19 April 2014. Take your sneakers out; this will be a dance marathon.